Welcome to our range of Christmas suggestions for pipe smokers. We have selected a range of Gift Sets, Pipes, Tobaccos and Accessories which are ideal for the novice or veteran pipe smokers. No matter how big or small your budget, we have something to bring a smile to the face discerning pipester. You do not have long to order in the perfect Christmas gift for either your self, a loved one or a hint to Santa. These dates are only a guide line and orders placed after may still arrive in time, but are not guaranteed by Royal Mail. We have created a wide selection of Christmas gift packs, ideal for novice and experienced smokers alike. Each of our gift packs come in festive packaging, reducing the need to wrap your present and not making it obvious what’s inside. With packs starting at only £44.99 for our “Best of British” gift set. Every pipe smoker wants a new Pipe for Christmas, they might not admit it, but deep down we all do. So if you are choosing for yourself and planning on dropping hints or buying for a loved one. Our festive pipe selection has something for everyone at a variety of different ranges. A pipe is nothing without a good quality tobacco and here at GQ Tobaccos we are passionate about the scared leaves. No matter what your style, strength or flavour we have something for everyone. With over 200 tobaccos in stock, we have selected a collection of the finest from around the world for this year festive suggestions. The GQ Blends Christmas Mixture will be discontinued in about 3 weeks time, so if you have not had chance to try this years, you do not have much time left. There is no smoke without fire and for any smoker a lighter is the most essential tool. While any lighter could be used to light a pipe, we carry an extensive range of specifically designed lighters. These lighters have angled flames, making it easier to light your pipe without burning your fingers or damaging the bowl. We are offering “Gift Packaging” on most pipes from our website over the festive period. Each pipe is packed inside a gift box and accompanied with pipe cleaners, a milled metal pipe tool and small cleaning brushes. Turning any pipe (with the exception of Churchwarden shapes) into the ideal gift set for any pipe smoker and for only £5 extra. 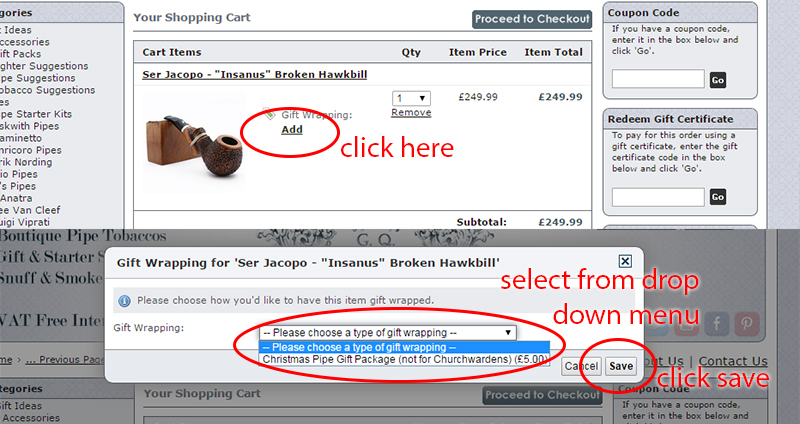 To add this gift page, click “Gift Wrapping : Add” and select Christmas Pipe packaging. We will then the package out all packed up ready to give on December 25 th.